Grace Lin has some adorable Ling & Ting paper dolls up on her blog — the perfect activity to keep my daughters (ages 5 and 10) busy during these last few moments of school vacation week. I know we're not supposed to judge by covers and all, but I'm guessing that the publisher BOOM! Town has us mistaken for some other book review journal. A shipment of The Creative Company's review copies recently arrived -- creatively packaged in a box emblazoned with text from their fiction and biography frontlist titles. Any guesses as to which seasonally appropriate novel this is? "As you go into the sitting-room in the Stahlbaums’ house, on your left-hand side you will see a tall glass cabinet set against the wall. All the children’s toys are put away there for safekeeping. Louise, the elder sister, was still quite little when her father had this cabinet built. 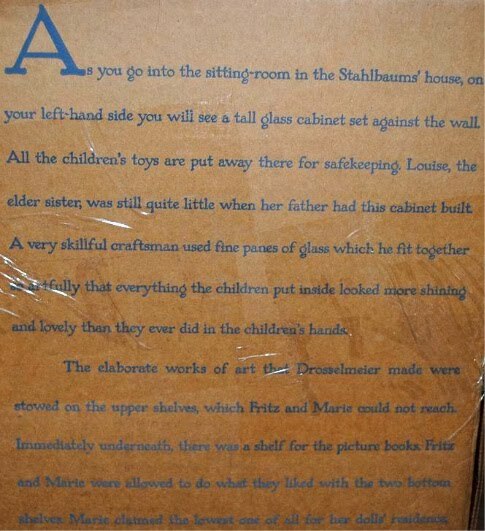 A very skillful craftsman used fine panes of glass which he fit together so artfully that everything the children put inside looked more shining and lovely than they ever did in the children’s hands. The elaborate works of art that Drosselmeier made were stowed on the upper shelves, which Frtiz and Marie could not reach. Immediately underneath, there was a shelf for the picture books. Fritz and Marie were allowed to do what they liked with the two bottom shelves. Marie claimed the lowest one of all for her dolls’ residence..."
Quick question: which would you rather read, a book that tells you reading is fun, or a book that is fun to read? Judy Sierra and Marc Brown's Wild About Books, first published in 2004, manages to be a little bit of both, as bookmobile librarian Molly McGrew turns a whole zoo onto the pleasures of the printed word: "She even found waterproof books for the otter / Who never went swimming without Harry Potter." 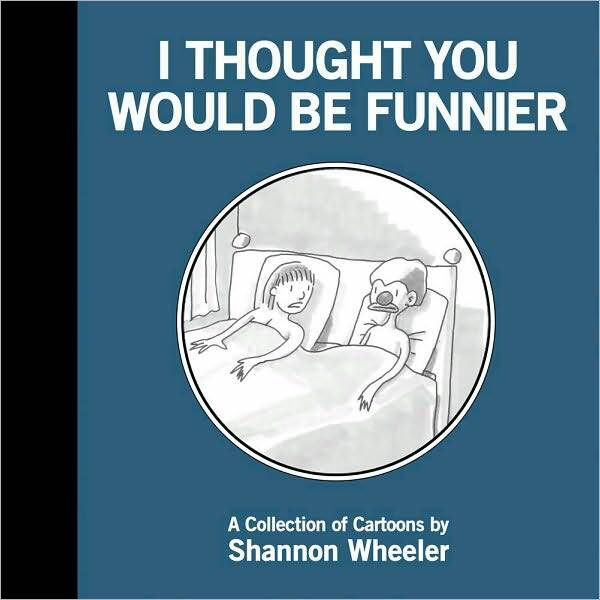 Reading-is-fun books tend, unsurprisingly, to come to foregone conclusions, but the messagey nature of this one is ameliorated to a great extent by Sierra's witty and expert rhymes and Brown's illustrations, packed with animals to find and count. And the book gets a huge boost in appeal in its new iPad iteration from Random House. Placing aside discussion of the irony of a digital celebration of print for another time, let's just look at some of the added value of this new edition. Younger kids who might miss some of the book's in-jokes (about reviewing, for example, harrumph), can still enjoy poking the scorpion to hear his stinging critiques ("Stinks. "), and every screen offers similar opportunities to make the animals jump around, hoot, or, in the case of the hyenas reading a joke book, laugh like, er, hyenas. Balls can be tossed about, clouds can be moved around in the sky; the giraffe's neck makes a satisfying sproing when pulled down and released. What gives the book a real spring is its apparent three-dimensionality: the pictures are put together in layers which reveal themselves when the iPad is moved; tilting the device to the right or left causes new bits of the pictures to emerge and even small movements give the pictures an agreeably gently bounce. 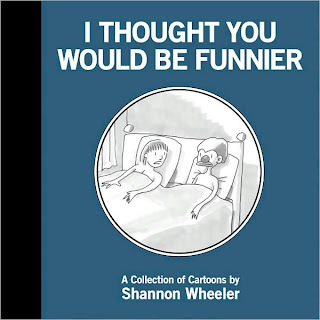 One caveat: do the reading aloud yourself, as the supplied optional narrator has that over-perky talking-to-children tone that we professionals had trained out of us in library school. I have to admit, my initial response to Mark Binder's CD A Holiday Present! Christmas, Kwanzaa, Chanukah, Ramadan, Diwali, Solstice, New Year's (Light Publications) was unenthusiastic. The carefully non-denominational cover illustration and the tagline "Warm, joyful, and fun adventures celebrating giving and family" had me bracing for some seriously touchy-feely PC crap. Includes "We Wish You a Merry Multicultural End of Year Holiday Season" hit single? Gimme a break. I was relieved to discover that this collection of family-oriented holiday stories ranges from silly to thoughtful, with just a hint of subversion. Binder explains his inspiration for the song "We Wish You..." with the story "The Little Drummer Boy Medley," in which he and his Christmas-abstaining family suffer through a seemingly never-ending Xmas muzak medley -- on the day after Thanksgiving. "And they didn't even do the David Bowie and Bing Crosby version!" Some tales (like "The Gold Coins") have a traditional feel about them; others (e.g., "The Boy Who Hated Potato Latkes") are clearly Binder originals. Plenty of wacky voices and places to chime in will engage little listeners. Just as importantly, adults can listen with kids without being hit over the head by morals or contracting deadly Raffi-itis. 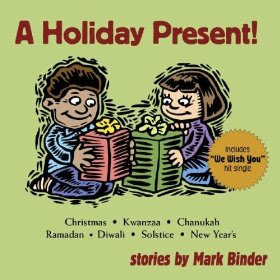 Binder says, "One of the things that we do around the holidays is -- in order to keep warm -- we tell stories, because stories fill our minds and spirits." Having grown up in a family whose Thanksgiving celebration always includes Arlo Guthrie's "Alice's Restaurant", it feels like a good combination to me. But even if you don't normally make storytelling a part of your Festivus festivities, A Holiday Present! does make a nice break from "The Little Drummer Boy." December's Notes from the Horn Book is full of Fanfare goodness, with glowing recommendations of 26 of the year's best-of-the-best books for children and young adults -- plus an interview with honoree Megan Whalen Turner. The December Notes is available online at the Horn Book website, but make sure to subscribe so you don't miss out on upcoming issues. Mike Austin's A Present for Milo is Ruckus Media's first app created expressly for the iPad and lacking a print predecessor. 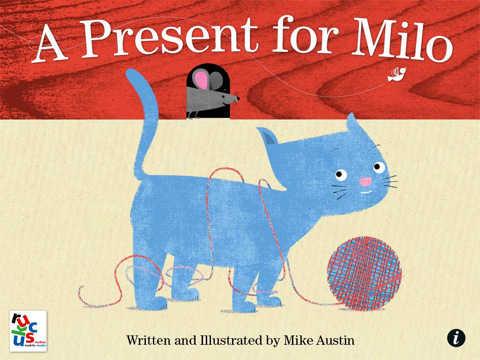 The story is simple: Milo, a kitten, chases a mouse through the house until they reach -- surprise! -- a birthday party. This is all perfectly acceptable board book material given added dimension here by a plethora of finger-poking opportunities: a framed painting of a sailboat reveals an octopus when touched, another mouse can be found playing in a ball of yarn, hit the light-chain and the room goes dark, each effect accompanied by crisp sound effects. Austin reads the printed text aloud (barring words like boing or bounce, which are represented by sounds and visuals instead) but it's easy to lose its thread what with all the hidden effects and noises to discover (the mouse in the flying saucer is my favorite) before swiping to the next scene. If not particularly characterful, the pictures are cleanly drawn and offer lots to point at--just mind your finger, as you never know just what is going to pop next. $1.99 at the iTunes store, recommended for 2-4 year-olds. 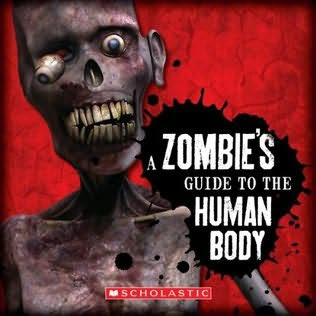 In the same vein (pun intended) is A Zombie’s Guide to the Human Body: Tasty Tidbits from Head to Toe published by Scholastic. Professor Zombie adds his own editorial comments and zombie-centric visuals to basic information about body systems (skeletal, digestive, urinary, muscular, cardiovascular, etc.). Every page is littered with blood splatter, unidentifiable splotches of pus-like gore, drool stains, and zombie photos taped over images of living people. It’s gimmicky and distracting and not at all an essential purchase for libraries, but for a zombie-phile reluctant reader, it might be the perfect match of book and reader. The professor offers such nuggets as “SKULLS HARD! COVER UP BRAIN! SKULLS BAD!” and “BRAIN COMES IN 2 SERVINGS” and “FOR QUICK ENERGY TRY LIVER.” Bon appétit! We're delighted to announce the 2010 Horn Book Fanfare list, our picks for the best children's and young adult books of the year. Read more about each of these excellent titles -- plus an interview with honoree Megan Whalen Turner -- in the December Notes from the Horn Book, coming next week. Sign up for the newsletter and view Fanfare lists since 1938 on our website. The Spring 2011 Horn Book Guide will be published in April -- but you can get a sneak peek now. We've just updated the Guide Online database with 209 new reviews of titles published from July to December 2010. ¡Muy bueno! Leslie Patricelli's Higher! 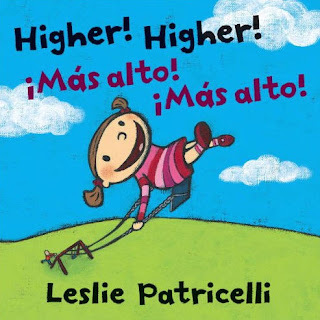 Higher!, a 2009 Boston Globe-Horn Book honor book, will be reissued as a bilingual board book (Higher! Higher! / ¡Más alto! ¡Más alto!) in January, along with The Birthday Box / Mi caja de cumpleaños. Look for reviews of two brand-new Patricelli titles, Potty and Tubby (all Candlewick), in the January/February 2011 issue of The Horn Book Magazine. Though Elissa laments the lack of good Hanukkah books published this holiday season, we've compiled a list of tried-and-true titles to last at least the next seven nights. Check 'em out here. And while you're at it, see what else -- like a Harry Potter and the Deathly Hallows movie review -- is new on the Horn Book website. Every year in the November/December issue, the Horn Book Magazine presents Holiday High Notes, reviews of recommended new holiday books. The list usually consists of a majority of Christmas books, with a few Hanukkah titles and maybe a couple of Kwanzaa books thrown in. This year, though, there are no Hanukkah books on that list at all -- not a one. And it’s not that the goyem at the Magazine have it in for the chosen people; it just doesn’t seem like there are that many new Hanukkah books this year (or if there are, the publishers didn’t send them to us). 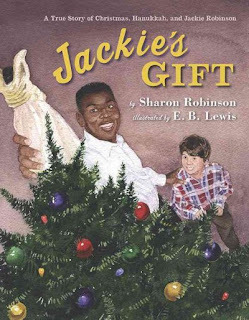 The few that we did receive either arrived too late for the Magazine or were too meh to be considered “high notes.” In Jackie’s Gift: A True Story of Christmas, Hanukkah, and Jackie Robinson, Sharon Robinson continues to mine her father’s legacy, this time presenting a heartwarming picture book about the barrier-breaking baseball player delivering a Christmas tree to his Jewish neighbors. Also new are Eight Winter Nights by Laura Krauss Melmed and The Hanukkah Trike by Michelle Edwards, both perfectly acceptable but neither destined to become a classic. 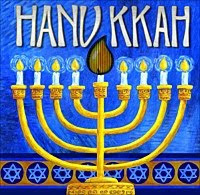 The Kvetch Who Stole Hanukkah by Bill Berlin and Susan Isakoff Berlin also showed up; not to sound too Grinch-like, but the title is the funniest thing about it (though bubbes and zaydas may get some chuckles from the goings-on in Oyville). The most entertaining -- and baby-friendly, so you know which one will be coming home with me -- is Accord Publishing’s Hanukkah, a holographic “AniMotion” book that shows, as you flip the pages back and forth, a dreidel spinning, latkes flipping in a pan, etc. Fun to look, at but more fad-ish than Jewish. I’m sure there are others out there this year. Anyone have any to recommend? What about perennial favorites? The Festival of Lights begins tonight. What books will be under your Hanukkah bush?